Description of "બાપુનાં પારણાં (Bapuna Parna) (eBook)"
Bapuna Parna is a Gujarati Poem book by Jhaverchand Meghani first publisehd in 1944. Jhaverchand Meghani (28 August 1896 - 9 March 1947) was a noted poet, writer, social reformer and freedom fighter from Gujarat. He is a well-known name in the field of Gujarati literature. He was born in Chotila. Mahatma Gandhi spontaneously gave him the title of Raashtreeya Shaayar (National Poet). Besides this he received many awards like Ranjitram Suvarna Chandrak and Mahida Paaritoshik in literature. He authored more than 100 books. 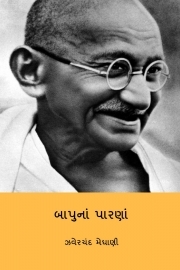 Reviews of "બાપુનાં પારણાં (Bapuna Parna) (eBook)"